Clean out leaves and organic debris out of the stream, waterfall, and skimmer before starting the pump. Check the filters and clean them as needed. They will need to be cleaned more often as the pond is starting up in the Spring. Check the liner, pump, waterfall, and stream for repairs. Begin feeding the fish once the water temperature reaches 50-60°F. Feed in the morning during cooler weather to give fish more time to digest food before cooler overnight temperatures. Plants that were overwintered in the pond can be brought up from the center and put in their proper places. Repot water lilies that are crowded for better blooming. 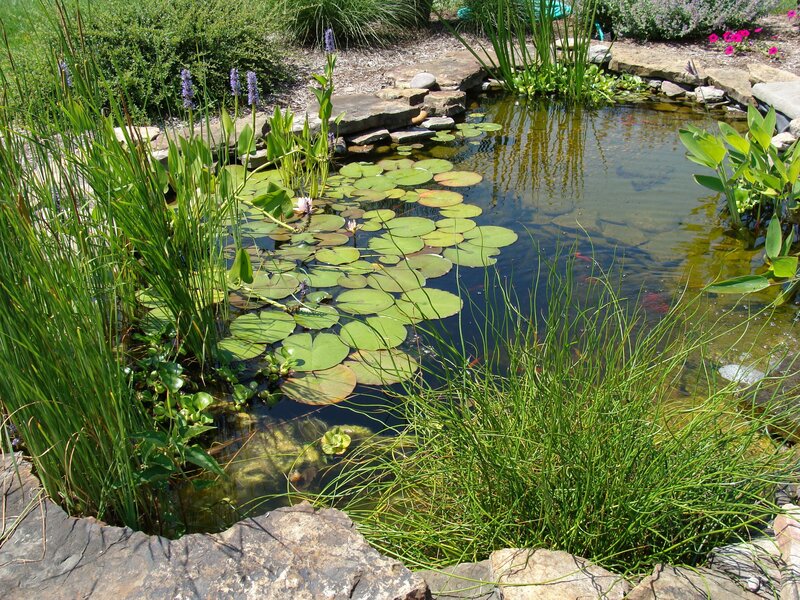 Add oxygenating and annual water plants to the pond – these will also help reduce algae and keep the water cleaner. Check the water level. If your fish were overwintered in the pond, add water in intervals to prevent the temperature or balance of the water from changing all at once. If your fish were indoors, add water and balance it before adding the fish. Fertilize hardy plants every 2 weeks now through August. If black gunk has accumulated on the bottom of the pond, or the pond is 3-5 years old, it may need a thorough cleaning. Fill a holding tank with old pond water to house the fish while cleaning. A small pump should be added if the fish will be in there for more than a couple hours. Drain the pond and remove leaves and twigs by hand. Begin power washing or using a garden hose from the top of the pond down. Place the pump at the bottom of the pond to help drain it. Your goal is to remove larger built up debris, not every speck of algae. Do not use cleaners, only plain water. As the drained water runs clear, turn off the hose and pump. Hose off all parts of the skimmer and filter until the water runs clear. Replace old filter pads and bio filter material as needed. After the pond has refilled with water, de-chlorinate it before adding fish or plants. Periodically introduce some of the new pond water to your fish holding tank. You want to do this over a period of time to gradually acclimate the fish to the new pond water and temperature. Place the fish back into the pond once they have been acclimated. 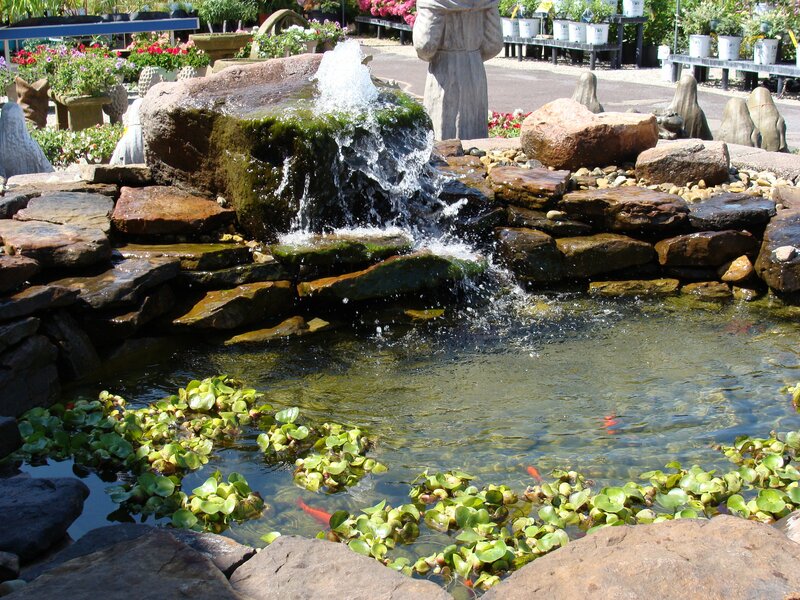 Add beneficial bacteria (available in the Garden Center) to the pond water. You may also add barley straw products to help control algae.